Weekend Part 2: Do You Really Think That's Wise, Sir? Our first stop on Sunday was Thetford again, where the Charles Burrell Museum was opening for the season. The museum showcases the steam-powered engines for industry, transport and fairgrounds once made on the premises, although we were mostly interested in seeing Corporal Jones's butcher van, which also lives there. I had pushed strongly for a visit to Great Yarmouth, our next destination. The pier featured in more than one episode, but I was mostly interested in sausage and chips, a look at the sea and a play on the 2p machines at the amusement arcade (I didn't win anything). Afterwards we headed to Cromer, largely because I'd been before and remembered both the town and the coastal route from Great Yarmouth as pretty. Black clouds threatened but I had a Lemon & Lime Ripple ice cream anyway. It was shot through with bright green and someone stopped me on my way to the beach to ask what flavour it was. Back to the hotel via a quick peek at pretty Weybourne Station, featured in the episode The Royal Train and now privately-owned. More rain was forecast on Monday, but pushing off around lunchtime, so we delayed our departure. 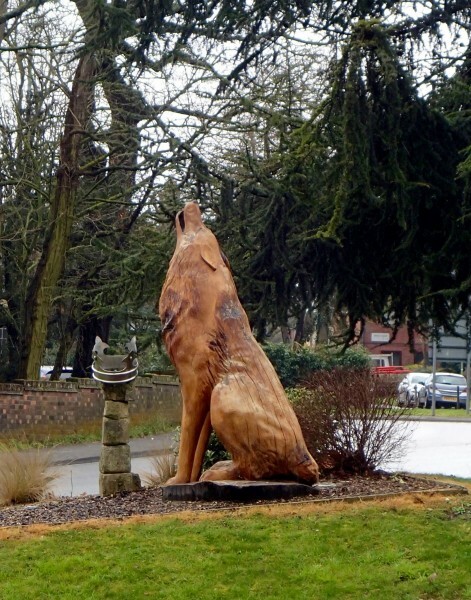 The journey home was by way of a roundabout in Bury St Edmunds so we could admire the carved wolf guarding it (a wolf kindly looked after Edmund the Martyr's severed head until it could be reunited with his body). You say 'kindly looked after', I think 'saved for dinner but got interrupted'. Apparently the wolf was so helpful it called out in Latin to let them know where the head was. HMMM.